Tin Knocker, nice Winchester. What cal.? Its not a Winchester but thats no biggie, its a Marlin model 1894 calibre 25/20. Nice small game & plinking round. I been collecting, or accumulating them for a couple years now. I like old Winchesters too but theyre usually priced out of my range. Besides the Marlin is a much simpler action & easier to rebuild & restore. I'm a far cry from a gunsmith & Marlins accommodate me better. 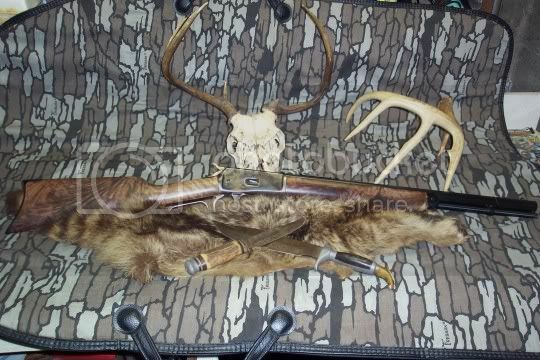 This ones a Winchester model 92 copy I exercised gun control on by restocking it, its made by Rossi in Brazil. Someday I'll get a couple real ones but it'll have to wait till the kids are out of school. For now this'll tide me over. 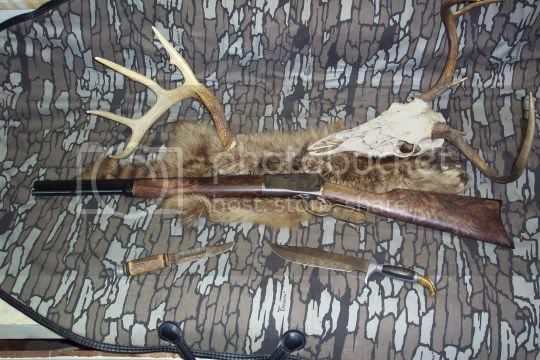 Its chambered in .357 mag & has taken one deer so far. He gets off on trashing any thread on any subject. Nah, I only get off on thrashing people who thrash people they don’t agree with. He is a gadfly. Ignore him. Too bad ya can't ignore me, eh? nothing ever gets resolved. people end up staying on the same side of the argument that they went into it with. but it sure brings out the best of human ignorance. So ya claim that everyone who disagrees with ya is ignorant? But I guess America is slowly recovering from its own ignorance regarding policing hostile territories. Their usual strategy is to keep the enemy under military pressure, while the Dutch's is to make the enemy irrelevant by construction projects and consistent political & social support which hopefully will transform the enemy into allies. Right now the American military in Afghanistan is slowly adapting to the philosophy of that of the Dutch. FYI the Afghans are all armed with firearms and yet they are still threatened by the Taliban. The Dutch-led force of about 2,000 soldiers has adopted what counterinsurgency theorists call the “oil spot” approach. Under this tactic, it concentrates efforts in less hostile areas, especially a basin around Tarin Kowt, the provincial capital, which overlaps an economic development zone designated by Hamid Karzai, the Afghan president. The central idea is that if foreign military forces show restraint and respect, and help the local government to govern, then these areas will expand, slowly but persistently, like an oil stain across a shirt. As they grow, the theory says, the Taliban’s standing will decline. Such counterinsurgency tactics are not new; they are only back in vogue, with a new generation of officers drawing lessons from past military operations in Indonesia, Malaysia, Borneo, Vietnam and elsewhere. Similar tactics have reappeared in American units in Iraq, as both the Army and the Marine Corps have been rewriting doctrine along the same lines. Funny aint it, how some folks will argue points about forien policy in a debate about domestic law as if its meaningful beyond his demonstrating ignorance of the subject. Those poor Afghans sure are still threatened, but being armed held off both the Russians for a much longer period than the unarmed Dutch could hold off Hitler, years longer, matter of fact they never lost. Theres a difference between being threatened & being helpless, unless your unwilling to admit you are wrong. The truth is the Dutch could learn from them. After all, they dont owe their existance to other countries, America in perticular. But thats off topic aint it. 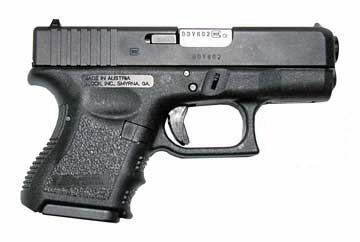 Today I'll excercise gun control with a S&W model 39 9MM in my belt. Tricky D only thinks the Dutch are unarmed. I doubt if any Dutchman turned in any of the weapons they found after WW2. I also understand they have some form of national militia similar to the Swiss. BTW - Holland is open and flat farmland. No way could they withstand a combined air and armor attack with the equipment they had in 1940. I doubt if any Dutchman turned in any of the weapons they found after WW2. Because ya believe that peace can only exist through superior firepower? I also understand they have some form of national militia similar to the Swiss. It used to be that every healthy male of 18 with a Dutch passport was automatically enlisted (with the exception of criminals and people who suffer(ed) from a mental disorder), but since we do not enlist anymore the Dutch army has a great shortage of people. Probably because nobody is desperate enough or naive enough to join the army. No way could they withstand a combined air and armor attack with the equipment they had in 1940. That was never our intention; we believed that we could remain neutral like we were during WWI. Beautiful wood on that 94 Tin! They don't make em' like that anymore . I'm sure you would be totally willing to turn her in for the public good though aye? LMAO. Sorry , couldn't resist. Yeah Tin, I looked at the first one for awhile and wondered if it was a Marlin, so I threw the dice. I knew a guy years ago that had a collection of Winchesters, seemed like every model and caliber made. He had a gun shop and retired and I don't know what happened to them. I have a 1920's Model 94 in .32 Special, carbine. I don't know how many deer it's been responsible for. My dad had it. And now you believe that you can remain unarmed and free. If the US loses it's freedom, the entire world will follow.